A collaboration of genetic and agricultural scientists from the U.S., Mexico, France, Kenya, and China have conducted a comprehensive analysis of the corn genome. The team, led by researchers from Cornell University and the USDA’s Agricultural Research Service, and funded by USDA and National Science Foundation, published their findings online in the journal Nature Genetics (paid subscription required). Corn is a major crop in the U.S. and worldwide, providing food for humans, livestock, and serving as a source of biofuels. In the U.S., growers produce 12 billion bushels, more than a third of the world’s supply, a crop valued at $76 billion. The results of the studies are published two separate reports. One study, led by Agricultural Research Service and Cold Spring Harbor researcher Doreen Ware used a population scoring model to identify 55 million genetic variations, called single nucleotide polymorphisms or SNPs, in 103 varieties representing wild and domesticated corn. Ware’s team also found genomic similarities to a type of grass species called Tripsacum, which may offer opportunities to adapt desirable properties of Tripsacum — perennialism and frost and drought tolerance — into corn. A second report by a team under the direction of Jeff Ross-Ibarra at University of California-Davis tracked the evolution of corn over nearly 10,000 years from a wild grass in Mexico into today’s cultivated crop. 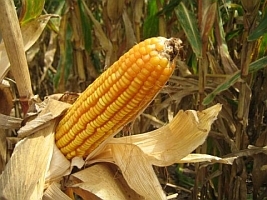 Their study involved sequencing of 75 lines of corn that shows some continuation of diversity even after domestication, as well as crossing back of genes with wild relatives among domesticated varieties. The researchers also found modern breeding has tended to solidify the traits developed thousands of years ago. The studies are expected to help increase corn yields in the face of climate change and loss of arable land, as well as improve corn’s ability to serve as a feedstock for biofuels. The tools developed by the researchers are also considered applicable to the study of genetic properties and history of other crops. In addition to Cornell University and Agricultural Research Service, researchers in the project represented University of Wisconsin-Madison, University of Missouri-Columbia, North Carolina State University, Beijing Genome Institute, China Agricultural University, Kansas State University, University of California-Davis, Université Paris–Sud–AgroParisTech, Arizona State University, and the International Maize and Wheat Improvement Center in Nairobi, Kenya and Mexico City, Mexico.